ALavandhAr previously spoke about the greatness of SaraNya (refuge – the lord) and in this pAsuram, to eliminate the thought of hesitation in us thinking “How can I approach such ubhaya vibhUthi nAtha (the lord of both worlds)?”, explains twelve qualities which are those who let the devotees engage in him. Alternatively – Previously bhagavAn‘s sarvESvarathvam (supremacy) is explained and now he speaks about his qualities which are apt to be spoken about. You are naturally a nectarean ocean of auspicious qualities such as being controlled (by your devotees), being generous (of presenting himself to your devotees), having sauSeelya (excellence in disposition, presenting himself to everyone without discrimination), being honest (in mind, words and actions), having purity (to show his mercy unconditionally), unable to bear the separation from his devotees, compassionate (cannot bear the sorrow of his devotees), sweet, firm in protecting (your devotees), being equal (for all who surrender unto him), one who engages in actions (of his devotees, considering them to be his own) and grateful towards his devotees even for the smallest of their acts. vaSI – Explains that bhagavAn will have full control of the previous explained supremacy. With this too, it is established that he is even more valuable, since he has supremacy and good qualities as well [just having one of them is not so great]. bruhadhAraNyaka upanishath 6.4.22 “sarvasya vaSI sarvasyESAnas sarvasyAdhipathi:” (One who controls everything; he is the lord of everything,; he is the ruler of all); sahasranAmam “jagath vaSE varthathEdham” (everything is under the control of krishNa). Alternatively – explains that those who are favourable towards his divine feet, he is under their control. SrI rAmAyaNam bAla kANdam 31.4 SrI rAma tells viSvAmithra “imau sma muniSArdhUla! kinkarau sampasthithau | AgyApaya yathEshtam vai SAsanam karavAva kim ||” (Oh best among sages! We are near you to serve your highness. You can order us. What should we do? ); mahAbhAratham krishNa tells yudhishtra “AgyApaya mahAbAhO! brUhi yaththE vivakshitham | karishyAmi hi thath sarvam yathvam vakshyaSi bhAratha ||” (Oh mighty armed! You express what you desire! Order me. Oh dharmaputhra! Whatever you say, I will do that fully); mahAbhAratham “svayamEva harir vavrE viprapAdhAvanEjanam” (Hari himself washed the divine feet of the brAhmaNas [who are dear to him]); varadharAja sthavam 20 “anyAdhInathvam …” (While vEdhas speak about your independence, we see that you are dependent [on your devotees] …). If one thinks that his subservience towards his devotees is for others, that is not correct – purely out of his own independent will, he takes that upon himself since there is no one to control him. vadhAnya: – What is the act of such ASritha pArathanthriya (one who is submissive towards his devotees)? He bestows himself and his properties to his devotees – that generosity is explained here. “priyavAg thAnaSeelaScha vadhAnya: parikIrthitha:” (One who speaks sweetly and is generous, is said as “vadhAnya“); yajur vEdham kAtakam 7.5.36 “ya AthmadhA baladhA:” (That paramapurusha (supreme lord) who gives himself and the mental strength to enjoy him); SrI rAmAyaNam ayOdhyA kANdam 16.27 “… sa sarvANarthinO dhrushtvA samEthya prathinandhya cha ||” (That SrI rAma, looking at those who came to accept alms from him, welcomed them, gave them joy and united with his friends); SrI bhagavath gIthA 7.18 “… udhArAs sarva EvaithE gyAnIthvAthmaiva mE matham” (All [four] of them are generous, but the gyAni is the one who sustains (me) – this is my principle); jithanthE sthOthram 1.5 “na thE rUpam …” (my forms etc are not for me but for my devotees). guNavAn – His Seela guNam (quality of mixing with others freely) which he uses to retain those who move away from him thinking about their own inferior nature and bhagavAn‘s superior quality of bestowing himself and his properties. Since this section is dealing guNams (qualities), here “guNavAn” is not a common term indicating auspicious qualities as said in “Seelam hi nAma mahathO mandhais saha nIrandhrENa samSlEsha:” (Seelam means, a great person mixing freely with an inferior person), here it is talking about Seela guNam. Since it is said “guNyatha: ithi guNa:” (that which is likeable is called guNa), as guNa cannot be left out by the one who is experiencing [bhagavAn], here, guNa indicates Seela. This is like the word “SAla” which indicates a tree as well as a specific type of a tree. purusha sUktham “ajAyamAna: … ” (the unborn, assumes many births), Starting with SrI rAmAyaNam bAla kANdam 1.2 vAlmIkI asks “kO nvasmin sAmparatham lOkE guNavAn kaScha vIryavAn …” (Who is with guNam (qualities) in this world now? Who is very potent now?) 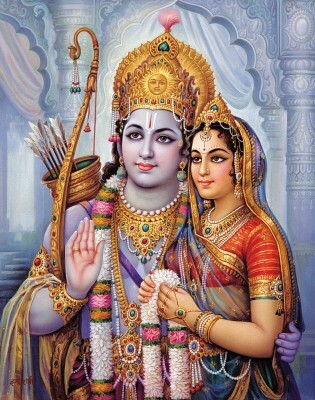 and nAradha responds SrI rAmAyaNam bAla kANdam 1.8 “… ikshvAku vamSa prabhavO rAmO nAma guNAkara:” (That SrI rAma, the descendant of ikshvAku dynasty, has the best qualities). As said in SrI rAmAyaNam ayOdhyA kANdam 1.7 “babhUva guNavaththara: | sa hi dhEvairudhIrNasya …” (Due to the prayers of dhEvas to have rAvaNa killed, the ancient vishNu appeared in this mortal world; Such Sri rAma is greater than his supreme state of vishNu, in qualities), the effect of Seela guNam is avathAram (incarnation). ruju: – While appearing like this [in this mortal world], since different people have different tastes, he presents himself to elevate them as water is pushed up into higher plains. Arjava means being harmonious in his mind, thoughts and speech towards his devotees. sundhara bAhusthavam 30 “yajjAthIyO yAdhruSO yathsvabhAva: … thajjAthIya: thAdhruSa: thath svabhAva:” (Out of his vAthsalyam towards his devotees, sundhararAja unites with them based on their birth, activities, qualities etc); SrIvaikuNta sthavam 66 “thadhvai thathAsthu kathamO’yamayO svabhAvaO yAvAn yathAvidhaguNO bhajathE bhavantham | thAvAmsthathAvidhaguNas thadhInavruththi: samSlishyaSi thvamiha thEna samAnadharmA ||” (Leave aside what was explained before. How amazing is his nature! (that is) In whichever nature, form, qualities etc., one worships you, you unite with him by presenting him yourself with such nature, qualities, actions which are submissive under him and with practices which are similar to his). Suchi: – While helping others, instead of looking for some favour in return, you are so pure that you help them without any expectations. As said in manu smruthi 5.106 “… yO’rthE Suchis sa hi Suchir na mrudhvAriSuchi: Suchi: ||” (Among all aspects of purity, one who is pure [unperturbed] with wealth is considered to be pure; one who merely purifies himself by soil and water is not pure), here it also explains the purity of bhagavAn who elevates a nithya samsAri (eternally bound soul) into the level of nithyasUri (eternally liberated soul) simply due to the sambandham [relationship between bhagavAn and AthmA]. SrI rAmAyaNam uththara kANdam 82.9 agasthya muni says “pAvanas sarvalOkAnam thvamEva raghunandhana” (Oh raghunandhana [SrI rAma]! you are the one who purifies all the worlds). In karma kANdam – garuda purANam 219.6 to 219.9 “bhakthirashtavidhA hyEshA yasmin mlEchchE’pi varthathE | sa viprEndhrO muni: SrImAn sa yathis sa cha paNditha: || mayA pUjyas sadhA chAlau madhbhaktha: SvapchO’pi ya: | thasmai dhEyam thathO grAhyam sa cha pUjyO yathA hyaham ||” (The mlEchcha [one who is outside the varNASrama system], who has these eight types of bhakthi, he is the top-most of brAhmaNa who meditates upon (bhagavAn); he is the one who has the wealth of kainkaryam; he is a renunciate; he is a scholar; though he is a chaNdALa, my devotee is always to worshipped along with me. One can give (knowledge to) him; and can accept (knowledge) from him; he is always venerable at par with me. mrudhu: – Since he treats them like this while being together, it is understood that he cannot bear their (his devotees) separation. Since the context is about Athma guNam (qualities of his nature), this shows the tenderness in his heart. SrI rAmAyaNam sundhara kANdam 36.42 hanumAn tells sIthA “naiva thamSAn na maSakAn …” (Since Sri rAma’s mind is fixated on you, he does not even drive away the flies, ants, worms and snakes from his body); SrI rAmAyaNam sundhara kANdam 66.10 SrI rAma tells hanumAn “na jIvEyam kshaNamapi …” (I cannot even bear sIthA’s separation for a moment); SrI rAmAyaNam yudhdha kANdam 5.9 “avagAhyArNavam svapsyE …” (Oh lakshmaNa! let me dive deep into the ocean without you and sleep there, so I can cool down the scorching love [of separation]). dhayALu: – dhayA means “Unable to bear the sorrow of his devotee’s sorrows” – paradhu:ka asahatvam. mahOpanishath “sa EkAkI na ramEtha” (nArAyaNa who was alone during deluge was not joyful); SrI rAmAyaNam ayOdhyA kANdam 2.42 “vyasanEshu manushyANAm bhruSam bhavathi dhukkitha:” (He feels the pain of the suffering of lowest of humans); if this is explained commonly, his mercy towards his devotees is incomprehensible. SrI bhagavath gIthA 7.17 “… priyO hi gyAninO’thyartham aham sa cha mama priya: ||” (Among these four, the gyAni who is always united with me and is exclusively devoted to me is the best. For such gyAni, I am very dear and he too is dear to me); SrI rAmAyaNAm sundhara kANdam 15.50 hanumAn says “sthrI praNashtEthi kAruNyAth” (out of compassion due to thinking “a woman was abducted” …); SrI rAmAyaNam sundhara kANdam 38.35 “sa tham nipathitham” (Sri rAma protected … the one [kAkAsura] who fell on the ground ….). madhura: – emperumAn‘s sweetness is explained here – he is so sweet that even if he is merciless he cannot be given up. That is, being relishable for each entity in its own way. thaiththirIya upanishath “rasOvai sa:” (bhagavAn is embodiment of taste); thaiththirIya upanishath Anandhavalli 7 “Esha hyEvAnandhayAthi” (He only gives pleasure to jIvAthmA); thaiththirIya upanishath “rasam hyEvAyam labdhvAnandhI bhavathi” (this jIvAthmA reaches paramAthmA who is embodiment of all tastes, and acquires joy) and so on. sthira: – If some one shows little attachment towards such relish-able emperumAn, he remains the one who removes the fear of such devotees, even when his own confidantes become enemies. SrI rAmAyaNam yudhdha kANdam 18.3 “na thyajEyam kathanchana” (I will never abandon this vibhIshaNa who approached me with friendship); SrI rAmAyaNam yudhdha kANdam 18.33 “abhayam sarva bhUthEbhya:” (I will protect you from everyone); periyAzhwAr thirumozhi 4.9.2 “en adiyAr adhu seyyAr …” (emperumAn to pirAtti – my devotees would not engage in wrong-doings, even if they do, it is with good intent). sthira: – He will remain unperturbed, even if his devotees engage in unfavourable acts. sama: – Being equal to all those who surrender unto him in spite of the shortcomings in their gyAnam (knowledge), vruththa (actions) etc. SrI bhagavath gIthA 9.29 “samOham sarva bhUthEshu” (I am equally disposed towards all creatures); thiruvAimozhi 1.6.3 “Idum eduppum ilAdhAn” (bhagavAn’s quality of not rejecting any one due to their defects and not accepting any one due their qualities (i.e., being neutral towards every one)); thiruvAimozhi 1.6.5 “koLgai koLAmai ilAdhAn” (bhagavAn who does not accept some (seeing their good qualities) and reject others (seeing their bad qualities)). kruthI – Would be ready to accept orders [from his devotees]; If some one surrenders unto as mentioned here, he would consider their duties/responsibilities as his own. When a devotee attains bhagavAn, bhagavAn will consider that as his own benefit. SrI rAmAyaNam bAla kANdam 1.85 “abhishichya …” (vibhIshaNa who was crowned by SrI rAma); SrI rAmAyaNam ayOdhyA kANdam 31.24 “… thava chArtha: prakalpyathE” (your desire will be fulfilled). kruthagya: – In this manner, even after doing so many favours, he would always consider their simple favourable act as something very great. He will be ignorant their offences. sahasranAmam “avigyAthA sahasrAmsu:” (He is ignorant (about his devotees’ mistakes) and knowledgeable (about his devotees’ noble acts)). He will also be ignorant of his favours [he will not consider them to be great]. His nature is explained in mahAbhAratham udhyOga parvam 47.22 “… ruNam pravruththamiva mE hrudhayAnnApasarpathi ||” (dhraupathi called out to me saying “gOvindha!” from far and I am unable to shed that cry like a debt (which grew manifolds due to interest build up)). kruthagya: is also explained as emperumAn always feeling bad for not helping his devotees enough. SrI rAmAyaNam yudhdha kANdam 124.19 “SirasA yAchatha:” (SrI rAma says – bharatha, my dear brother, requested me with great anxiety, but I did not fulfill his request). thvamaSi – In comparison to bhagavAn (the abode of the qualities) himself, the qualities don’t shine [bhagavAn outshines his qualities]; alternative explanation – the qualities too shine due to the contact with bhagavAn. svabhAvatha; – These qualities are not imaginary/fabricated. Alternative explanation – they are natural and cannot be said as acquired subsequently. samastha kalyANa guNmaruthOdhadhi: – All the qualities [individually] are auspicious, infinitely enjoyable and are like an ocean for those who pursue them. “ishukshayAnnivarthanthE … mathikshayAnnivarthanthE na gOvindha guNakshayAth” (Soldiers are returning due to lack of arrows and not because of having destroyed the earth and the sky; similarly people withdraw from glorifying gOvindha due to shortcomings in their knowledge and not because of having completed glorifying his qualities). This entry was posted in Other, sthOthra rathnam on December 31, 2016 by Sarathy Thothathri.